American alligator (Alligator mississippiensis), Fakahatchee Strand National Preserve, Florida. 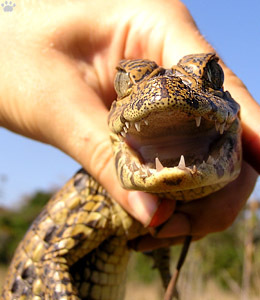 In 2005-2011, I've been working on a Ph.D. thesis about Crocodilians (that's the scientific name for an ancient group that includes crocodiles, alligators, caimans, and gharials). 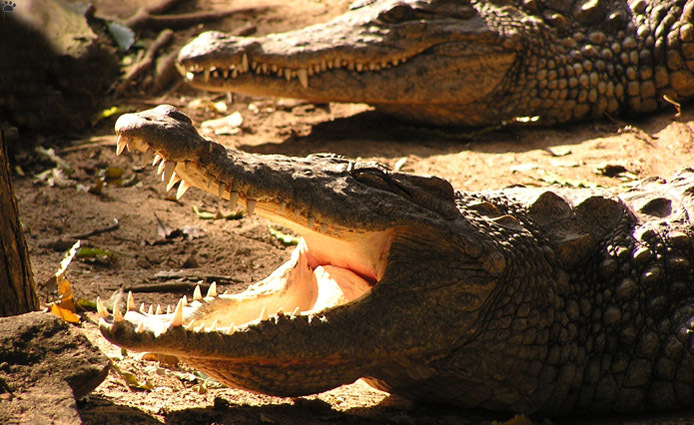 The official title of the project has been changed a few times, but the unofficial name was "Croc Songs" - it was about the mating behavior of those creatures, particularly their sound and infrasound communication. 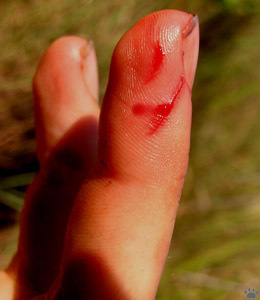 The resulting thesis can be seen here; below is a 20-page collection of crocodilian photos, most of which were obtainned during that study. 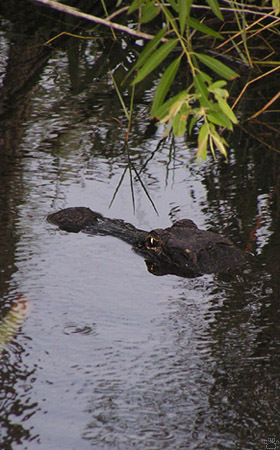 American alligator, Arthur R. Marshall Loxahatchee National Wildlife Refuge, Florida. pool. Reserva Biologica del Beni, Bolivia. When we see crocodiles in a zoo or in the wild, they usually don't do much - just bask at the water's edge, moving so little that people often suspect them to be plastic models. I expected this project to be boring. But as soon as I started spending long hours in the field, I found that these animals can be very animated, especially at night during the mating season. I don't think I've ever had a boring hour working with them. didn't have much to eat in its dry lake, and had clean teeth. 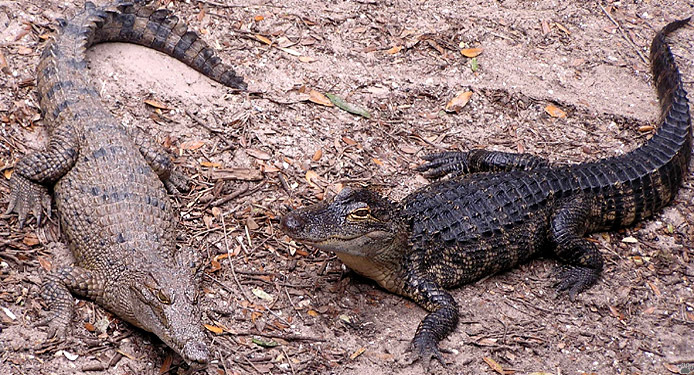 American alligators, Lower Suwannee National Wildlife Refuge, Florida. 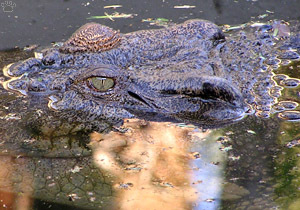 Saltwater crocodile (Crocodylus porosus) is the largest living crocodilian. Bitarkanika Wildlife Sanctuary, Orissa, India. 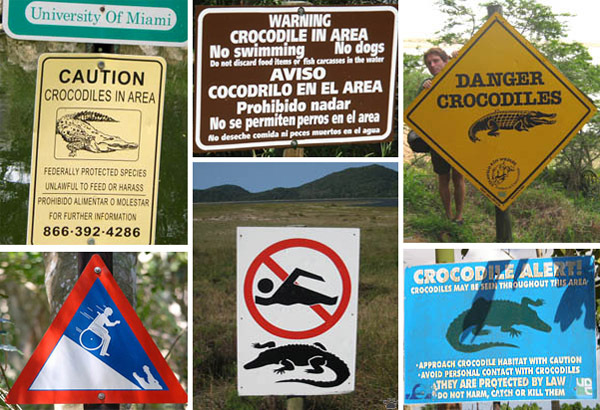 Crocodilian behavior in the wild is very complex and surprisingly little known. Some of the stuff I've seen has never been described. and Palau. Bitarkanika Wildlife Sanctuary, Orissa, India. Juvenile New Guinea crocodile (C. novaeguineae) and American alligator, St. Augustine Alligator Farm Zoological Park, Florida. 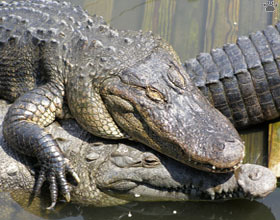 American alligator and American crocodile, GatorWorld, Florida. 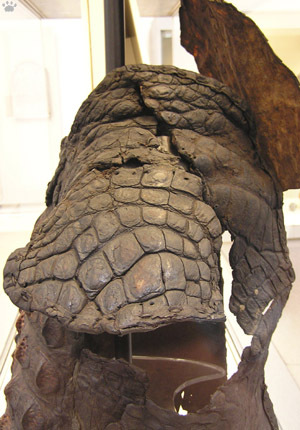 Crocodilian anatomy is highly advanced, especially the senses: they have excellent underwater and night vision, acute hearing and sense of smell, can perceive infrared light, infrasound, electrical fields, and precisely measure temperature. 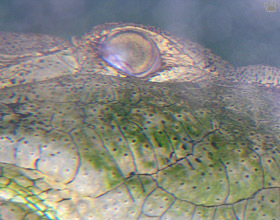 Saltwater crocodile underwater at night, SAAFZP, Florida. 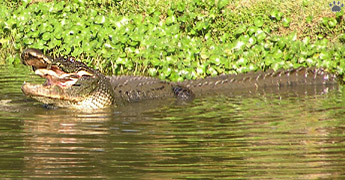 Nile crocodiles (C. niloticus), Murchison Falls National Park, Uganda. 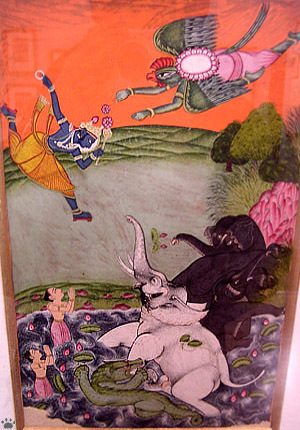 Vishnu coming to rescue the king of elephants from the crocodile demon. Kotah, Rajasthan, 1750. The National Museum of India, Delhi. Humans have driven some of them to extinction or near-extinction, but if there's not too much persecution, they can quickly come back from the brink. 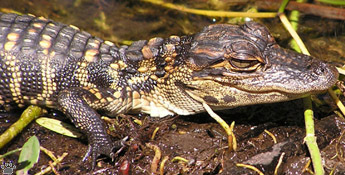 Nowadays the main problem for many rare species of Crocodilians is not overhunting, but loss of habitat. (AD 1145-1149). The British Museum, London. don't pay much attention to it. Ocala National Forest, Florida. killed by cars while crossing the roads. Miccosukee Indian Reservation, Florida. 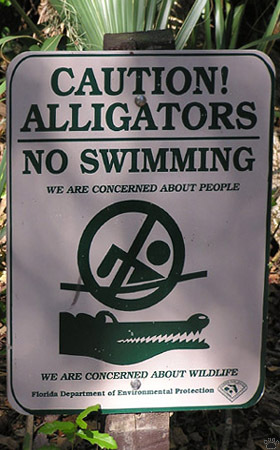 Riverside sign, Big Cypress National Preserve, Florida. If protected, they once again become the top predators in their habitats - a position they've kept since the Jurassic, when giant crocs were hunting dinosaurs in rivers and swamps of a much warmer Earth. I feel privileged to study these fascinating monsters, smart and tough enough to survive all mass extinctions of the past 100 million years without changing much. My photos from the real-life Jurassic Park are in the following pages. 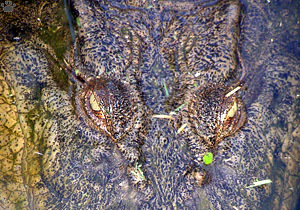 American alligator, Big Cypress Nat'l Preserve, Florida..
Croc signs from Florida, South Africa and Australia.